Grandparents get a kick out of this personalized grandkids ornament that is fun for both generations! 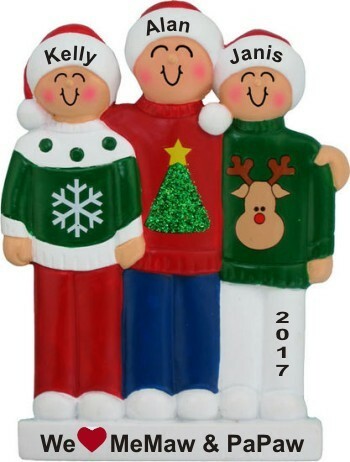 The 3 grandkids holiday sweaters love for grandparent(s) personalized Christmas ornament is a bright and cheery gift personalized for the recipient. One of our lettering pros will add the information you share, but it will be stylishly painted by hand to create a personalized grandparents gift that is one of a kind. It’s one of many personalized grandparents ornaments in the Russell Rhodes collection, so browse them all for your favorites and to start a collection that will be enjoyed for years to come.